O'Bannion, Melvin & Benny. Original 画像 belong to Universal Pictures, アイコン によって DarkSarcasm.. 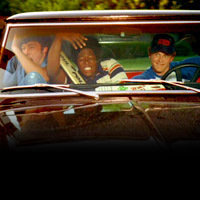 Images in the Dazed and Confused club tagged: dazed and confused image icon o'bannion benny melvin ben affleck cole hauser jason o. smith. This Dazed and Confused icon contains 自動車, suv, トラック, and 車.